For more than 20 years, Königsee Implantate based in Königsee, deep in the Thuringian Forest in Germany, has been developing and producing implants and instruments for traumatology, orthopedics and spinal surgery with enormous success. In the course of continuous process improvements, two new Tornos EvoDeco 16 machines have been purchased. Within the medical industry, Königsee is a significant manufacturer with a history that dates back to the end of World War I. In 1919, orthopedic technician Otto Bock founded the company in Berlin to provide disabled war veterans with prostheses and other orthopedic products. Shortly after, the company moved to Königsee. This was the origin for Königsee Implantate GmbH, which was established by Erich Orschler in 1993. 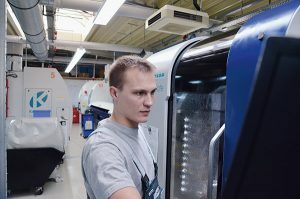 Königsee’s success story started with a small machine inventory and the strong determination of its employees. Initially, the company focused exclusively on the development and manufacturing of osteo-synthesis systems for traumatology and orthopedics. For more than 10 years now, the company has also been offering solutions for spinal surgery. The products for almost all bone sections, from the collarbone to the toes, accelerate the healing process of fractures compared with conventional methods of treatment. New solutions constantly arise from close collaboration with physicians and surgical teams. 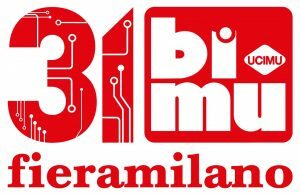 The development projects comprise the complete path of the value chain, from the idea and development of a prototype, to the manufacture of the product. During this process, painstaking attention is paid to quality, since it is the basic requirement for the long service life and safe use of implants. This is why the company purchased two new EvoDeco 16 machines from Tornos. In layman’s terms, an osteo-synthesis system consists of a plate that is matched with the anatomy and fastened to the bones with a variable number of screws of different lengths and diameters. Königsee offers the entire manufacturing process, from purchase and planning, through milling, turning, grinding and galvanizing, to the final inspection and warehousing. Pricing pressure has reached the medical industry and this means that top-quality produce from Germany can only be competitive by applying a sophisticated manufacturing strategy. For this reason, Königsee has invested in Tornos. All the screws are produced in the turning shop. Fractures require screws of different lengths and diameters, and with different properties. Depending on their use, the screw types produced are self-tapping, self-drilling or reverse-tapping. The threads are either full threads up to the head or partial threads. Threads are whirled with various pitches, while heeding the tightest shape tolerances. The head faces usually have a hexagon or hexalobular (Torx) socket. 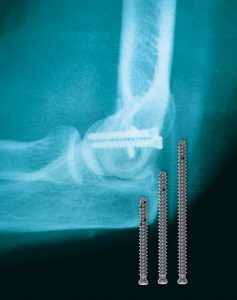 Most of the screws are cannulated, featuring a channel to drain the tissue fluid. The material used is usually titanium or implant steel. Even if it is not difficult to machine titanium, it offers up two special challenges, low thermal conductivity and difficulty in breaking the chips, which requires special cooling strategies. Tool wear is very high due to the extreme toughness of the material. Varying lot sizes are between 25 and 150 pieces. All screws must be as burr-free as possible in order to minimise rework. Although Königsee had already been well positioned with seven Tornos machines, the company decided to purchase two new EvoDeco 16 machines. Thanks to their kinematics and tooling, Tornos EvoDeco machines are pre-destined for manufacturing complex workpieces with high quality. Christian Hedwig, manufacturing engineer for turning operations at Königsee, emphasises the decisive reason for purchasing these machines: “Up to then, we had been using Deco 13 and Deco 20 machines. On the two new machines, we can produce a larger diversity of parts, which makes us much more flexible. To do so, the EvoDeco 16 machines have been further optimised by Königsee. A high-pressure coolant system by Müller Hydraulik has been installed with a pressure of up to 150 bar to feed directly to the individual tool blocks through a manifold block. This configuration significantly improves chip breakage and evacuation. As a consequence, tool life and process stability are extended. Stability is said to be a major advantage of the Tornos machines. EvoDeco 16 machines are designed to operate with high reliability and produce parts with dimensional accuracy over a long period of time. Another interesting point is that the new EvoDecos have reduced production times by up to 30%. The employees of Königsee are full of praise after having started series production. They soon became familiar with the machine, since the TB-Deco control functions are user-friendly and were already known to the company. At present, the machines are running across three shifts. 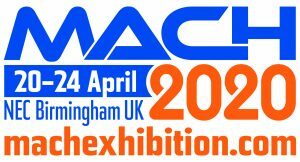 In terms of capacity, the new DMC 1850 V vertical machining centre from DMG Mori, with 1,850 x 700 x 550 mm axis travels and a maximum table load of 3000 kg, sits between the company’s 1450 model and the DMF range of travelling-column machines. A one-piece cast-iron bed, twin ballscrews in all axes, a cooling system and linear scale positional feedback to the Siemens 840D or Heidenhain TNC 640 control with proprietary CELOS interface, combine to deliver accuracy that includes circularity of less than 5µm. The machine is thus suited to mould making and the production of precision aerospace parts. There is a choice of spindle with 15,000, 20,000 or 40,000 rpm maximum speed or an optional SK50/HSK-A100 spindle offering up to 288 Nm of torque. The standard tool magazine capacity is 20 pockets, which may be expanded to 120 if desired, while the maximum tool length is 400 mm. Short non-cutting times result from automatic tool change in under one second and 5 m/s² acceleration in all axes to a rapid traverse rate of 42 m/min. Ergonomic operation is another feature of the machine, thanks to a door that opens to nearly 2 m and a distance from the front of the machine to the centre of the 2,160 x 750 mm table of just 677 mm. The bed inclines steeply at 35°, which together with flushing ensures that chips are removed efficiently. 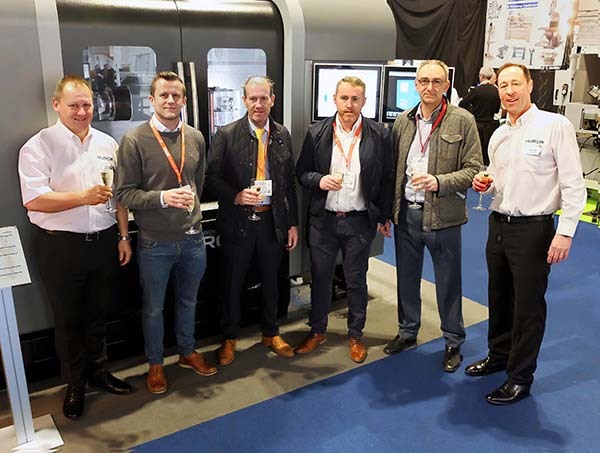 Birmingham-based Summit Patternmaking has acquired a Hurco VMX42SRTi B-axis machining centre that will double the pattern and tool maker’s five-axis machining capacity, although the firm also operates four three-axis VMCs. The production of models and patterns for vehicle interiors is a particular specialism, accounting for two-thirds of turnover. Gauges, jigs, fixtures and tools for the automotive and aerospace supply chains are also found regularly on the shop floor. He believes that the 7.5 tonne Hurco machining centre with its 35 kW/119 Nm spindle is ideal for these applications. 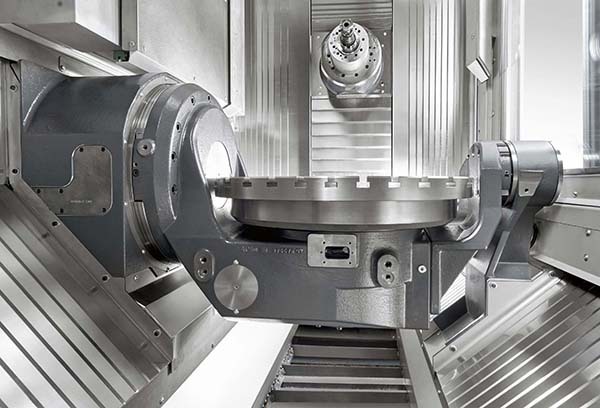 Provision of the fifth CNC axis via a ±90° swivelling spindle head rather than a trunnion was favoured, as it provides a larger working volume, right up to 1,067 x 610 x 610 mm for three-axis work. Tolerances held at the Birmingham factory are typically ±0.05 mm. 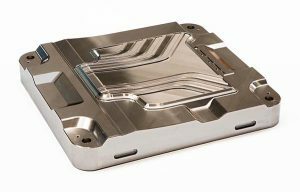 These are easily achieved on Hurco five-axis machines, which the company says are considerably less expensive than many models on the market that Willetts researched before placing the order. 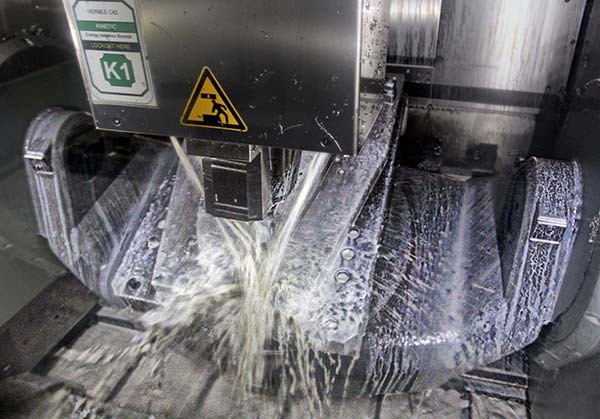 The cell includes a German-built Hermle C42UP twin-pallet, vertical-spindle, five-axis machining centre for finish-milling a titanium rib that forms part of the pylon’s construction. A pair of three-axis vertical machining centres for initially roughing material from the titanium billets, along with a large pylon assembly area, complete the equipment devoted to this project. Choice of the five-axis machining centre was key, as it was a significant tranche of the investment. 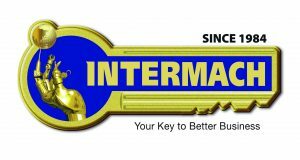 The Hermle option was selected based on suitability for purpose, value for money and an established, successful association with the UK sales and service agent, Geo Kingsbury. Other factors in favour of the supplier’s equipment were the Heidenhain control, the high-torque spindle necessary for machining titanium 24-7 and Hermle’s database of machining knowledge at its production plant in Gosheim, which included information directly relevant to the application. While all other ribs in an Airbus neo jetliner are made from aluminium, the pylon rib must be machined from titanium to withstand the higher temperatures generated by the new engine – either Pratt & Whitney’s PW1000G or the LEAP-1A from CFM International.